Why choose Symbiont as your "training & development" partner? Training encompasses a wide range of disciplines focused on enhancing peoples’ knowledge, skills and attitudes to generate improved individual performance in current areas of responsibility. The function of training is to prepare individuals to effectively perform specific tasks or sets of tasks. At Symbiont Performance Group we offer the capability to create and deliver customized, cost-effective trainig programs designed to transform learning into measurable individual performance improvement leading to increased organization-wide success. We view learning not as an event, but rather, as a continuing process aligned with organizational vision and directed towards attaining and exceeding business objectives. Our capabilities include expertise and resources in both on-site and distance learning formats as well as instructor-led and self-directed learning approaches. We develop and implement training programs to satisfy the specific performance requirements employees need to meet client organization's business objecives. To accomplish this, we work closely with clients to identify and define the desired performance behaviors people need to demonstrate and determine the most effective and cost-effective way to generate them. Our expertise lies in our ability to transform learning content into training initiatives that will quickly and effectively fulfill target learning objectives. Our programs are straightforward, well-organized and involve well-planned curricula with clear expectations. They can be systematically implemented throughout an organization to produce consisten, uniform learning results. what is the difference between training & development? Our training process follows a six phase model consisting of competency development, curriculum design, content development, implementation and learning evalualtion. A competency is a broad grouping of knowledge, skills, attitudes along with inherent talents that enable a person to be successful in a particlar role or responsibility. A competecy description employs language that clearly describes the specific component behaviors that constitue that competency. "Organize and maintain a system of records to enable easy access to customer histories," for example, would be a component behavior of the competency of planning and organization. Competency development is the starting point in creating an effective training program. It defines the objectives of a learning initiative. It specifically describes what the desired performance behavior should look like and sound like. It projects what the desired learning results should be. In defining performance competencies, we focus extensively on gaining consensus among all stakeholders in order to ensure that learners clearly understand what is expected of them and to minimize any future inconsistencies in the coaching and evaluation of performance behaviors. Needs analysis is an examination of the existing need for training within an organization. It compares the desired performance level (determined through competency development) to the current performance level to identify the performance gap(s). Needs analysis determines what a proposed training initiative content should be and sets the stage for the design and development of the program curriculum. We belive that needs analysis is a step that is often not explored effectively. Many times training content is determined from unproven assumptions rather than from an effective needs analysis. This can cause resources to be directed toward the wrong objective resulting in a waste of valuable time and energy. There are other situations where a training initiative is selected to fix a performance issue when in reality, the problen is not the result of a knowledge, skills or attitude deficiency. The critical issue may lie in one or more areas of management that can directly affect an individual's performance. These may include issues relating to compensation levels, hiring practices, organization culture and many others. There is a saying that "if the only tool a person has is a hammer, then everything is a nail." Similarly, if training is the only discipline an organization does, then every performance problem will be a training issue. Since we at Symbiont Performance Group possess expertise in general performance consulting as well as training, we are able to help distinguish between training and other performance improvement needs, and will be able to advise clients acordingly. see Performance Consulting. The curriculum design phase of training focuses on creating the blueprint for the proposed performance improvement initiative. The fundamental function of curriculum design is the determination of the format of the individual elements that will comprise the proposed training as wells as their interrelationship. Basic format options for training include instructor-led formal classroom training, learner-directed manual-based or computer-mediated training, synchronous or asynchronous distance training, facilitated group discussions as well blended learning initiatives which involve various combinations of the above. Curriculum design includes the selection of appropriate media (audio or video), materials (computers, manuals, learning aids, etc. ), instructional techniques (lecture, simulation, role play) and learning transfer methods. It also includes the development of the training plan or agenda. Our approach at Symbiont Performance Group is to work with clients to design curricula that best meet organizational need. To accomplish this we take into account the needs, attitudes and preferences of learners and work to leverage the organizations learning resources. 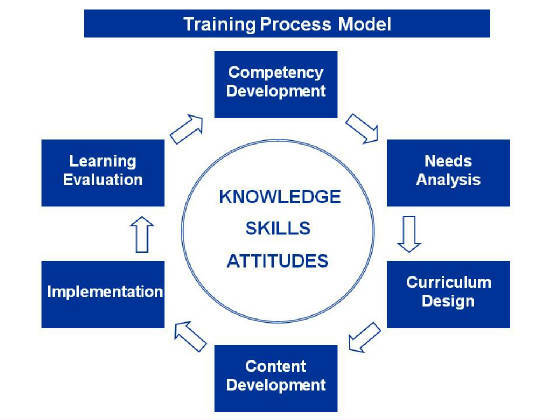 Training content development consists of acquisition and/or creation of each of the training program components identified in the curriculum design phase. Curriculum development often involves working with subject matter experts from within and/or outside the organization to capture specialized knowledge for inclusion of the training content. All the aspects of a training program come together during the implementation phase. The implementation phase is the point of impact for all of the time and effort devoted to the development of a training program. While the implementation phase must be well-planned, appropriately structured and practiced, it must also allow for adaptation to special situations that arise during content delivery. No two groups of learners have the same training needs, learning styles or motivation. Hense, skillful trainers, facilitators and training project managers must be continually on the watch for issues that call for modifications in the training implementation plan. Furthermore, the greater the level of anticipation of and preparation for such occurences, ther greater will be the overall level of success of a training initiative. This level measures the participants' reaction to the training program. It attempts to answer questions regarding the participants' perception. It only reflects the degree to which participants liked the training; it doesn't address the overall effectiveness of the training. However, the participants' reaction can be an important indicator, especially if their reactions are negative. Although a positive reaction does not guarantee learning, a negative reaction certainly can reduce its possibility. All of Symbiont's training initiatives employ levelone evaluation. Level 2 assessments measure the extent to which the learning objectives of a training initiative have been met. They attempt to assess the extent participants have advanced in the targeted knowledge skills and attitudes, i.e., have participants learned what the were supposed to learn. Measurement at this level is more difficult than level 1 evaluation. Instruments to perform level 2 evaluation include various forms of tests and ideally, the implementation of both pre and post tests to determine the amount of learning that has occurred. One of our strengths at Symbiont Performance Group is our expertise in creating effective and relevant level 2 assessments. Level 3 evaluation measures the degree of learning transfer, the extent to which the learning acquired in the training is incorporated into job respoinsibilities. This level represents a significantly more relevant level of evaluation because it measures the degree to which participants have actually learned to do what the were expected to learn to do. However, this level of evaluation is challenging because it is often difficult to predict the point when the desired change in performance behavior will be evident, and therefore, requires important decisions regarding when to evaluate and how to evaluate. Because this level of evaluation is so valueable, we routinely incorporate level 3 evaluation methodologies into our training programs. Level 4 evaluations attempt to assess training in terms of business results, i.e., return on investment. This level of evaluation measures a training program in terms that managers can understand. Level 4 measures would include metrics dealing with such factors as increased sales, increased production and improved quality. This is the best the most relevant level of evaluation because it addresses the reasons the training was implemented in the first place. Level 4 evaluation techniques can include post-training surveys, follow-up needs assessments and interviews of trainees and managers. The biggest challenge associated with level 4 evaluation is being able to determine that there was a valid cause-effect relationship between the training and any improved outcomes that occur.